At least one person was injured after a 6.9-magnitude earthquake shook western Guatemala, near the border of Mexico, on Wednesday, damaging homes and triggering landslides, officials said. 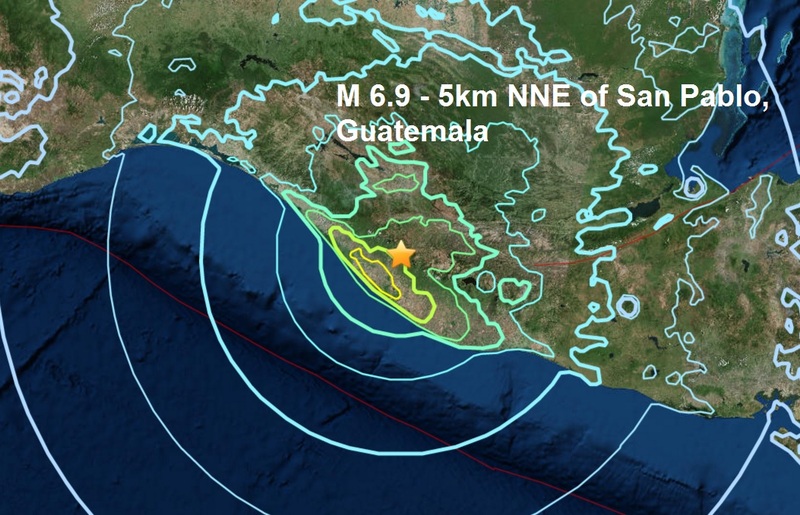 The earthquake struck at 1:29 a.m. local time in the department of San Marcos west of the capital near the Mexican border, Guatemala's emergency coordination agency said. The tremors were felt throughout the country. One man was injured when part of a church collapsed in San Sebastian Retalhuelu in southern Guatemala, the country's National Civil Police said. Authorities reported several departments, or states, without electricity. School was canceled on Wednesday for officials to inspect buildings for damages. The region of the epicenter is mountainous and sparsely populated with communities scattered around the base of the dormant Tajumulco volcano. Most residents are small-scale farmers or run small businesses. The earthquake swayed buildings in the capital waking residents, but not causing damage. Across the border in Chiapas, Mexico, Gov. Manuel Velasco said via Twitter that there were reports of cracked walls and shattered windows in Huixtla, but so far no injuries. The state's Civil Protection authorities said the quake was felt throughout the state.